I have a dog. Well, a dog has me. Maybe I’d best start with how I came in possession of my talking dog. Yes, I said talking dog. Don’t think dogs can talk? Well, hang on and I’ll explain. We’d lost our German shorthair, Molly in September, after thirteen wonderful years and we were devastated by the loss. My wife arranged with a friend who’d rescued an abandoned pregnant dog to take one of her pups for my birthday. I fell in love with this little roly-poly fur-ball at first sight and called him Teddy because he reminded me of a real live teddy bear. At the time he was nine weeks old and weighed just thirteen pounds. The vet took one look at him and told me that Teddy had dinner plate paws. I didn't know what he meant, but I soon learned. Two months later, he was already up to thirty-five pounds, and growing fast, though his appetite was never excessive. Our other dog, a shepherd mix named Bear, got along well with the pup, but was annoyed when the 'little' dog started herding him around the yard. Little did Bear know what would happen over the next six months when Teddy grew to equal Bear's ninety pounds and beyond. Then Teddy began to talk to us. Only one problem; his tongue wouldn’t let him annunciate properly. That didn’t deter him as he issued his guttural commentary any time he needed some attention. Not a growl or a bark, just an ongoing series of hilarious sounds, accompanied by hysterical expressions of his eyes and brows. This dog can make you understand what he wants with his face and his voice. 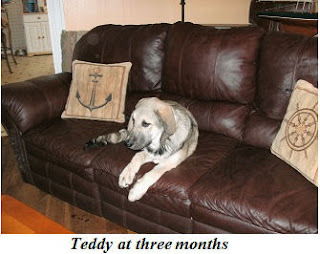 Now a whopping one hundred seventy pounds, Teddy is still growing, though he’s nearly mature at two and a half years. When Teddy barks, the walls shake and folks quake. The behemoth sounds ferocious, but in truth he’s afraid of his shadow. It is clear that he still thinks of himself as that little thirteen pound fur-ball that stole our hearts. Back to Teddy’s talking prowess. He loves to engage in dialogue with the missus and me. We begin a discussion and Teddy interjects his guttural commentary in ten to twenty second bursts. He hates being interrupted and gives us a ferocious glare if we try to talk over him. Usually ends with us laughing and wiping tears from our eyes from his sincere intensity. Because he doesn’t speak English and we don’t speak Dog, we have to guess at what he’s telling us, but it is always fun to try. Now I’m engaged in writing a romance, with Teddy as protagonist and narrator. He tells the tale of a woman who casts off hubbies like last year’s fashions, trying to find one who can get along with her big dog (Teddy, of course). There is a man in the story that gets along with Teddy, but Andrea has overlooked him. Do you see the catalyst for a good romance here? Yep, complete with the dreaded black moment and, naturally, a happy ending for man, woman, and dog. That’s my Teddy. Oh, if you’ve been wondering his breed? 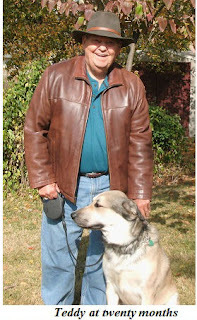 He’s an Alaskan Malamute/ Great Pyrenees mix, with a soft downy undercoat that makes him soft to the touch, warm to winter breezes, and a mess to clean up after. We once had a Malamute, Sebastian, who weighed in at one hundred pounds and was a handful in his own right. I expected Teddy to be about that size, but I got more than I’d bargained for. Truth told, I’m so in love with this dog, it doesn’t matter his size, or the extent of his shedding. We are grateful that he is such a positive, happy dog, though. If Teddy were a grouch, or God forbid, mean, I don’t think we could keep up with him. Darn, that dog is fast when he bolts. We have four foot fences and he could easily clear them if he only knew it. He doesn’t, and we want to keep it that way. His bark is enough to keep ne’er-do-wells away from our home, and where we live, those types are always nearby. Talk about a gentle giant! Luckily, we have an old Caravan with the middle seat removed. Well beyond two hundred thousand miles under its belt, it is now our canine cab. Bear and Teddy live for the weekends, when we take them for drives to one of the nearby Missouri state parks. With the physical problems in my legs now, I have to wait with the van while Patricia takes them for a long walk. One at a time. She’s taken them together a few times but at ninety and one seventy pounds, they’re almost too much for her. Especially when they roust out a deer or, on one occasion, a mountain lion that was lurking in the edge of the adjoining woods. So much for the myth of no mountain lions in Missouri. Suffice it to say, she did not return to the van smiling that day. The good news? He never bolted, even though she dropped the leash when she hit the ground. Like a good pal, he stood over her, looking around to see that she was safe until she could get her glasses bent back enough to see which way to go. And from the look on his face, he was very sorry for his boo-boo. And that’s Teddy’s Tale from Missouri with Pat Dale. Visit Pat at his website. I enjoyed your story. I have a similar one. Trying to train my pitbull/hound Quigley to not eat the lawnmover. Needless to say, my poor sister ended up with a fractured shoulder and bent glasses and he still wants to eat my mower. Here are a few fun facts about dogs. To raise a medium-sized dog to the age of 11 costs about $6,400, and that's not counting obedience school or college! Cynophobia is the fear of dogs, but we'll have none of that around here. I've seen these talking dogs. They're hilarious. I admire your wife. I have a 26# and a 14# dog and the big one just about knocks me off my feet when he sees a deer or rabbit (which is all the time around here). I finally bought collars to prevent them from pulling. After breaking my arm in three places and having a plate put in, I don't take any chances with falling. Thanks for sharing. Oh Ro, how painful! Broken in 3 places! Ouch, ouch, and super ouch! Yes, take NO chances about falling! Very well written and I loved your tale. Our 100 pound labs keep us hopping when they "bolt" but they also are so concerned with what happens to us that they usually stick around and don't go very far. Morning, ladies. We try not to count the cost with Teddy. Suffice it to say we buy good dogfood in LARGE bags these days. speaking about dog pulling power, I noted that the lead dog for one of the Iditarod dog sled race in Alaska looked a lot like Teddy, only a bit smaller. 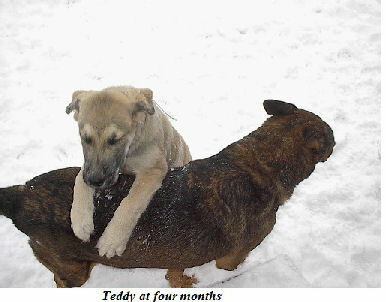 Because of his size, Teddy could pull like a champ but he'd not be able to go the distances those amazing dogs do. We had a hound dog (Shakespeare) at seventy pounds and sometimes he was too much for me to handle. Sadly, this Jan., at age 15yrs, we had to put Shakespeare to sleep. We have three dogs still, but the house feels like someone's missing. Dogs are absolutely amazing! Enjoyed your story. Thanks for sharing. I enjoyed your post about Teddy. I bet he's going to tell a great romance story. Sounds like he has the heart for it. I have to say, I once had a dog I thought said, "hello." She had a gutteral type noise that sounded just like it. I love talking dogs. My father-in-law insists they had a dog growing up that would say, "I love you, Mama." No amount of cookies will convince my pups to say it! But I keep trying!! Hi Karen! Oh, I'm so sorry about Shakespeare. I know what you mean. I lost my sweet Dolly over a year ago, and my heart is still broken. Teddy sounds like a dog we used to have when my son, Jeremy was 7. I'd love to have another just like him. Snapper (previously named before we adopted him at a shelter) was a gentle dog with had an outgoing personality. He talked to us in those gutteral sounds. One cool day we were leaving when Jeremy ran out of the house without his jacket. I yelled, "Go back and get your coat!" He argued that he didn't need one. Then Snapper put in his two-cents' worth using gutteral noises, eyeing Jeremy and turning his head this way and that. until my son relented. "Alright, I'll get my jacket. Just quit fussin' at me." We tried to be very quiet so Snapper wouldn't know where we were. We had just unwrapped our sandwiches when we heard a clatter. My husband had propped a 12-feet alumininum ladder against the open (unfinished) side of the treehouse. When we looked down, Snapper was six feet up and still climbing. Lol. Because Jeremy was concerned, he shouted, "Get down, Snapper!" Snapper; you'll make him fall." So we waited, holding our breath. On quaking legs, Snapper made his way to the top and managed to leap right over into the tree house. Enjoy Teddy and make all the fond memories you can. They aren't with us nearly as long as I wish they were. But while they are here, they work their ways into our hearts. What a great post. My little rescued Jack Russell is not very big and doesn't even try to pull me over - but in his own mind he thinks he's a Great Dane or a Rottweiler. He has the loudest growl and bark of any dog I know and often 'talks' in 'piggy' language. i.e. oink oink oink, means 'I want to go out' and he has various variations. People who don't love dogs really don't know what they're missing! Hi Pat! LOVED this. I just want to wrap my arms around this Mr. Personality. I would say dogs are human but I don't want to limit them to our level. LOL. They are smart, loving, giving, and intuitive. Love them and loved this time you spent talking about yours. My son and his wife have a husky mix dog who talks and he, too, has such sincerity over what ever it is he's trying to say. Personally, I have a Pekinese mix. She's tiny, but has such a personality and thankfully, isn't a yapper like some small dogs! One hundred seventy pounds? Oh my! I don't think I've ever met a dog that big. I bet he makes my two golden retrievers look like dwarfs!